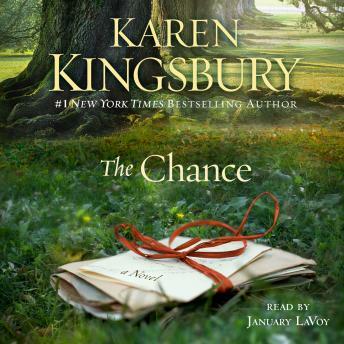 Listen to "The Chance: A Novel" on your iOS and Android device. From #1 New York Times bestselling author Karen Kingsbury comes a heartwarming story about childhood friends, broken lives, and a long ago promise that just might offer the hope of love for today. Dubbed the “Queen of Christian Fiction” by Time magazine, #1 New York Times and USA TODAY bestselling author Karen Kingsbury is arguably America’s favorite inspirational novelist with a dozen bestsellers to her credit. In The Chance, she delves deeply into a theme that resonates with us all: It’s never too late for those willing to take a chance. I love Karen Kingsbury! I'm reminded over and over again with each book how great of an author she is! Absolutely loved this book! An amazing story of love and forgiveness, anger and redemption. My only critique is that it was a easy to see where the story line was going. Would absolutely recommend this book! I bought this audio book through my job on clearance and I loved it. I loved the book and the narration. It was such a great book I couldn't put it down. I loved the ending. Such a great author. Loved this book! Loved the story and the ending, all the twist and turns made it hard to put down! This book is wonderful! If you've never read a Karen Kingsbury book before but you enjoy Nicholas Sparks, this is the book for you! Enjoyable from beginning to end. Touching story line and powerful message of forgiveness and redemption. Thank you Karen, thank you for sharing!! great book and I love this narrator, she is fantastic with multiple voices.